Note: These plans consist of a booklet of 24 pages of text, drawings and photos on 8.5" x 11" pages. The printed version is black and white. The PDF file for instant download has color photographs. To save $5 and postage costs choose the download option below. 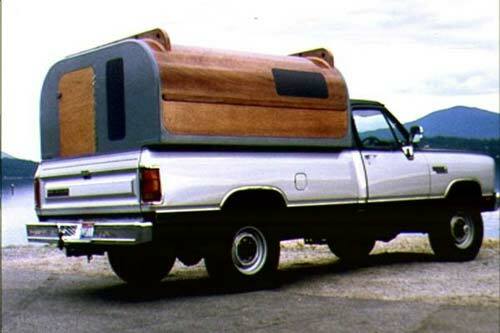 You can't buy a camper or topper like this, but you can build one, customized to suit your own rig and specific needs. Your camper can be fitted out with single or double doors and side windows can be screened sliding full length RV types, small non-opening marine deadlites or simple smoked Plexi or Lexan panels attached to the exterior surface. 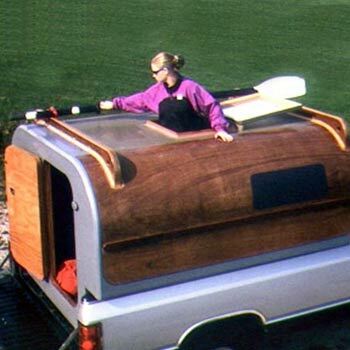 The overhead hatch can located forward or aft, on centerline or off to one side to allow opening the hatch while hauling a canoe, kayak or rocket box on the top racks. 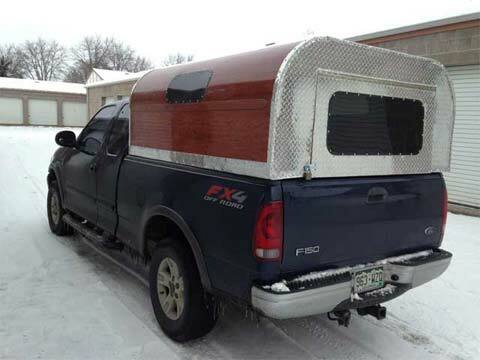 The top "escape hatch" can provide light, ventilation and handy access to items carried atop the camper. The racks are structural to provide support for hauling heavy loads. 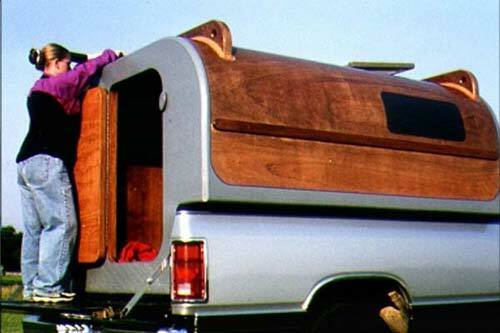 The interior layout is optional and can be modular and removable for cargo hauling, or intricate with permanent furniture, insulation, battery lighting, sound system and porta-potty for self-contained camping. 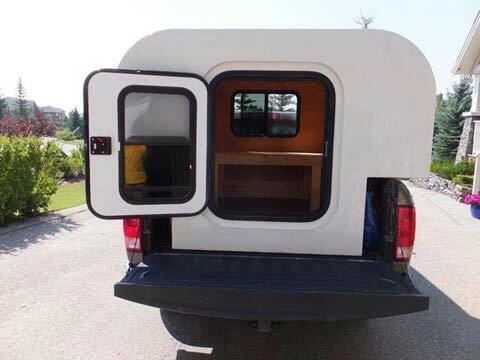 The Outdoor Life camper shown also has a 6 foot 2 inch long bed arranged crossways plus a small dinette. 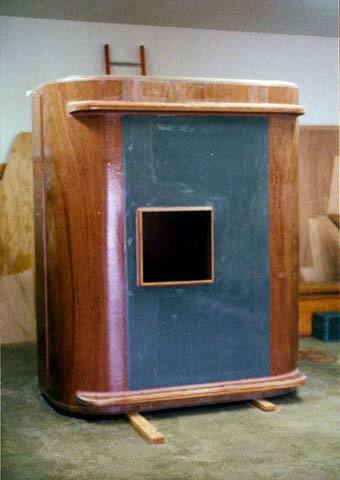 Exterior finish is optional and the camper can be finished natural as shown for a classy look or painted to match truck. The camper as shown weighs 260 pounds empty. 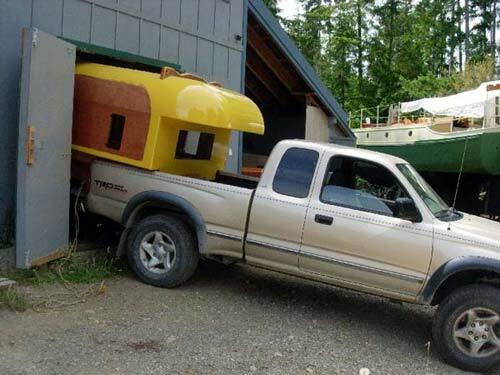 Four adults, one supporting each corner, can remove and replace the camper on the truck. Toppers, built to attach to truck bed sides and without a floor, usually weigh much less. 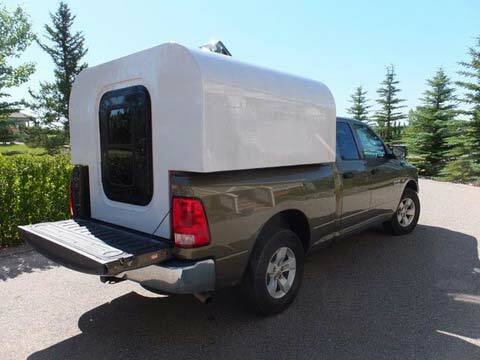 The crawl-thru access hatch attached to the sliding window of the truck cab allows heat from the truck cab to warm the camper and contents. Plans include a 33 page spiral-bound shop manual with photos, sketches, sources and step-by-step, with discussion of many options. 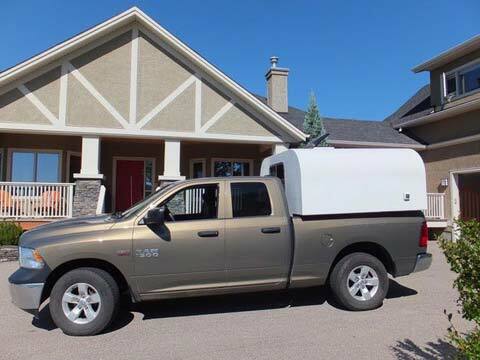 Campers and toppers have been built in a variety of configerations, interior layouts and finishes, for small compact trucks to full size long and short bed rigs, and mostly by amateur builders. The plans also discuss square corner "economy" or utility versions, as well as the large radius corners shown in photos. 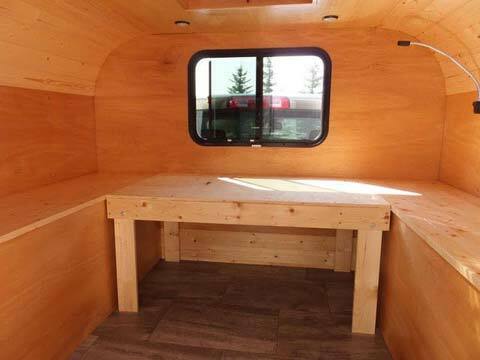 Paul, I built your truck camper, and am ridiculously self-satisfied with the result. Your plans were well-written, easy to follow and presented the project such that an amateur like me had little trouble completing it. Many thanks for putting this out there. My unit was sized to fit within a new Dodge Ram with a 6' 4" box. It weighs in at 640 lbs. 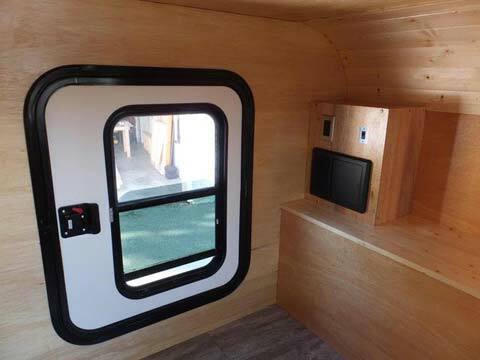 with a teardrop camper door, RV window, 14 inch variable speed ceiling fan, an inteli-power converter and LED lights. As you suggested, I covered everything in six ounce cloth and numerous coats of tinted epoxy. I built it over a three month period, devoting about 35 days to the project. I recessed the access door to allow the truck gate to close tightly against the back (the hinges protrude about 3/4 of an inch). Four strong friends were adequate to load it, though I've now purchased two cable jacks so that I can put it on and off myself. I reinforced the four corners during construction to add hard points for securing it to the stock cleats inside the bed of the truck. The system for making it secure took a little thinking, and a combination of ratchet straps and turnbuckles proved to work well. I took photo's during most of the construction phase and will happily share them with anyone who wants. I've included a few with this email. I've just returned from a three week trip to the Yukon where this thing proved extremely efficient. The truck barely knows it's there while driving (though the flat front of the camper where it protrudes over the cab collects a fair number of squashed bugs). Two removable inserts make for comfortable beds. 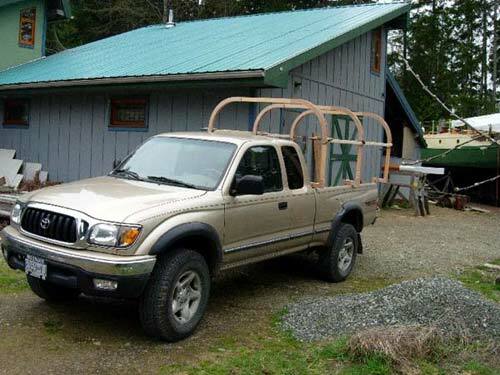 I still need to add the canoe rack, which I'll put on this fall. Once again, many thanks for this. Great design. 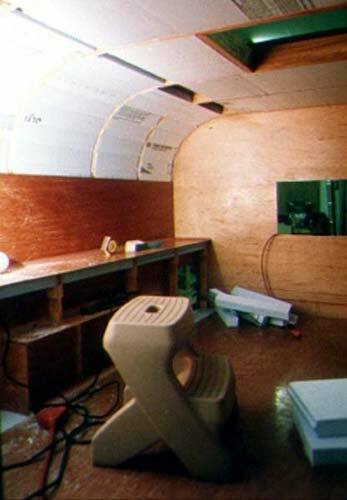 Hi Paul...just wanted to say how gratifying it was building the camper(it's kind of a hybrid topper/camper). I'm not much of a craftsman but following your plans I was able to build it pretty much with just a jigsaw and screw gun. I've received lots of positive feedback and can't wait to go camping! I finally decided to do something about the set of camper plans you sent me last year. 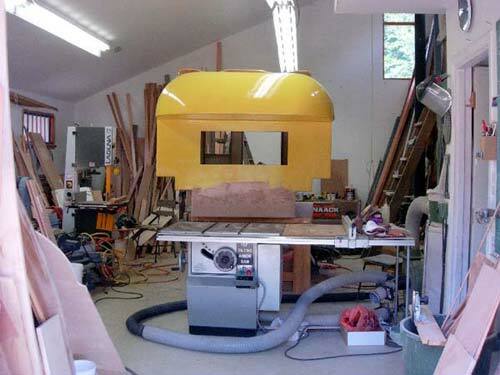 It has monopolized my workshop for the past several months. I'm not sure when I decided to add the frontal lobes. A fair bit of extra work, but ultimately worth it. I don't have a lot of room, so any additional storage space is valuable. It does provoke a lot of curiosity and admiration. Very gratifying to finally "launch" it out of my workshop and into the truck, where it fit like a finger in a glove. 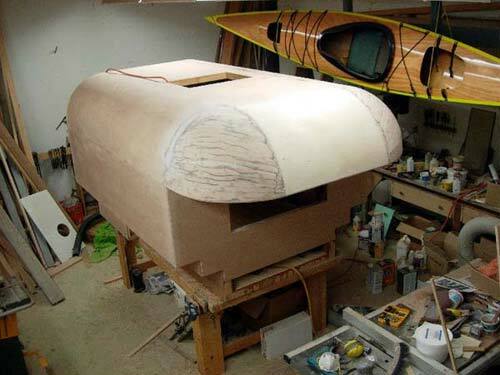 I am now fitting out the inside, and hope to send you further pictures. Once again thanks for the plans and inspiration. Regards, Simon G, British Columbia.